Why use Recurring ACH payments instead of recurring credit card payments ? ACH payment are the cheapest and easiest payment mechanism out there. QuickBooks only allows you to setup recurring Credit card payments while it doesn’t allow Recurring ACH payments ( may be because QuickBooks provides ACH for free while marks up credit card transaction fees ). 2) Easiest because almost everyone has a bank account and hence anyone can pay via ACH. 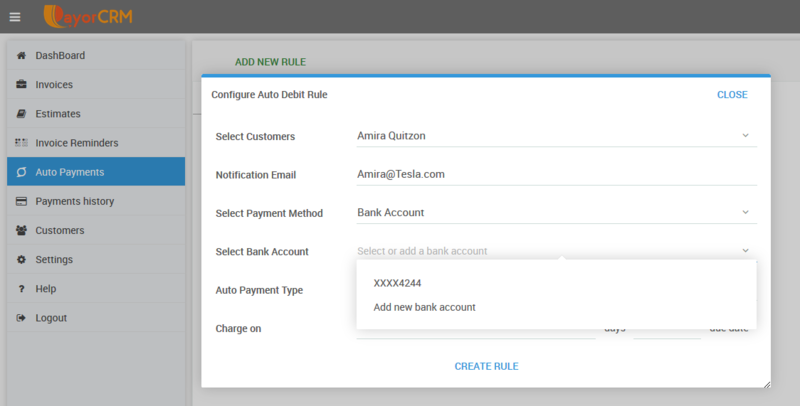 Who would need this feature of automating payments processing ? Any business which has more than 10 customers Bank account or Card on file will find value in setting up an automated payment mechanism for those customers. By doing so your business would have to spend zero hours having to manually process those recurring card payments or recurring ACH payments. Imagine the amount of man-hours spent saved through that! Who can set a recurring ACH payment on PayorCRM ? Either you or your customers can setup recurring ACH payments or credit card payments. What is the trigger for the payments to be processed on PayorCRM ?